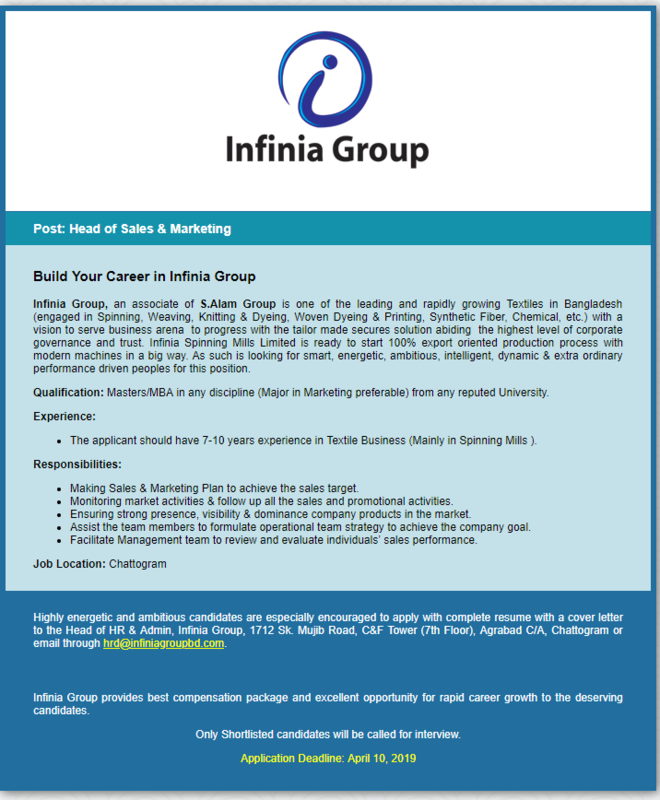 Infinia Spinning Mills Limited Job Circular 2019 has been published in the daily newspaper and to get form the BD Jobs Careers with necessary information such as published date, application limit, job circular image, salary, applying process etc. Anyway, we would like to inform you that, Infinia Group, an associate of S.Alam Group is one of the leading and rapidly growing Textiles in Bangladesh that work on Spinning, Weaving, Knitting & Dyeing, Woven Dyeing & Printing, Synthetic Fiber, Chemical, etc. However, if you are interested private company jobs circular, see this one by given popular job circular website in Bangladesh. Anyway, after reviewing if you think you are right candidate for this job please submit your application. ■ Applying Procedure: Highly energetic and ambitious candidates are especially encouraged to apply with complete resume with a cover letter to the Head of HR & Admin, Infinia Group, 1712 Sk. Mujib Road, C&F Tower (7th Floor), Agrabad C/A, Chattogram or email through hrd@infiniagroupbd.com. This entry was posted in All Jobs, Epaper Jobs, Graduate Jobs, Jobs Notice, Marketing/Sales, MBA Jobs, Newspaper Jobs, Observer Newspaper by admin. Bookmark the permalink.